Because current instruments don't allow astronomers to peer back at the universe's birth, much of what we understand about the Big Bang Theory comes from mathematical formulas and models. Astronomers can, however, see the "echo" of the expansion through a phenomenon known as the cosmic microwave background. While the majority of the astronomical community accepts the theory, there are some theorists who have alternative explanations besides the Big Bang — such as eternal inflation or an oscillating universe. The phrase "Big Bang Theory" has been popular among astrophysicists for decades, but it hit the mainstream in 2007 when a comedy show with the same name premiered on CBS. The show follows the home and academic life of several researchers (including an astrophysicist). This early soup would have been impossible to look at, because light could not carry inside of it. "The free electrons would have caused light (photons) to scatter the way sunlight scatters from the water droplets in clouds," NASA stated. Over time, however, the free electrons met up with nuclei and created neutral atoms. This allowed light to shine through about 380,000 years after the Big Bang. Arno Penzias and Robert Wilson, both of Bell Telephone Laboratories in Murray Hill, New Jersey, were building a radio receiver in 1965 and picking up higher-than-expected temperatures, according to NASA. At first, they thought the anomaly was due to pigeons and their dung, but even after cleaning up the mess and killing pigeons that tried to roost inside the antenna, the anomaly persisted. 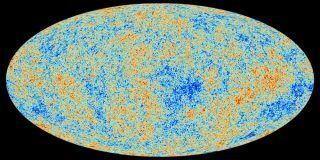 Simultaneously, a Princeton University team (led by Robert Dicke) was trying to find evidence of the CMB, and realized that Penzias and Wilson had stumbled upon it. The teams each published papers in the Astrophysical Journal in 1965. The cosmic microwave background has been observed on many missions. One of the most famous space-faring missions was NASA's Cosmic Background Explorer (COBE) satellite, which mapped the sky in the 1990s. Several other missions have followed in COBE's footsteps, such as the BOOMERanG experiment (Balloon Observations of Millimetric Extragalactic Radiation and Geophysics), NASA's Wilkinson Microwave Anisotropy Probe (WMAP) and the European Space Agency's Planck satellite. The maps give rise to new mysteries, however, such as why the Southern Hemisphere appears slightly redder (warmer) than the Northern Hemisphere. The Big Bang Theory says that the CMB would be mostly the same, no matter where you look. Examining the CMB also gives astronomers clues as to the composition of the universe. Researchers think most of the cosmos is made up of matter and energy that cannot be "sensed" with conventional instruments, leading to the names dark matter and dark energy. Only 5 percent of the universe is made up of matter such as planets, stars and galaxies. While astronomers could see the universe's beginnings, they've also been seeking out proof of its rapid inflation. Theory says that in the first second after the universe was born, our cosmos ballooned faster than the speed of light. That, by the way, does not violate Albert Einstein's speed limit since he said that light is the maximum anything can travel within the universe. That did not apply to the inflation of the universe itself. In 2014, astronomers said they had found evidence in the CMB concerning "B-modes," a sort of polarization generated as the universe got bigger and created gravitational waves. The team spotted evidence of this using an Antarctic telescope called "Background Imaging of Cosmic Extragalactic Polarization", or BICEP2. "We're very confident that the signal that we're seeing is real, and it's on the sky," lead researcher John Kovac, of the Harvard-Smithsonian Center for Astrophysics, told Space.com in March 2014. But by June, the same team said that their findings could have been altered by galactic dust getting in the way of their field of view. "The basic takeaway has not changed; we have high confidence in our results," Kovac said in a press conference reported by the New York Times. "New information from Planck makes it look like pre-Planckian predictions of dust were too low," he added. The results from Planck were put online in pre-published form in September. By January 2015, researchers from both teams working together "confirmed that the Bicep signal was mostly, if not all, stardust," the New York Times said in another article. Separately, gravitational waves have been confirmed when talking about the movements and collisions of black holes that are a few tens of masses larger than our sun. These waves have been detected multiple times by the Laser Interferometer Gravitational-Wave Observatory (LIGO) since 2016. As LIGO becomes more sensitive, it is anticipated that discovering black hole-related gravitational waves will be a fairly frequent event. The universe is not only expanding, but getting faster as it inflates. This means that with time, nobody will be able to spot other galaxies from Earth, or any other vantage point within our galaxy. "We will see distant galaxies moving away from us, but their speed is increasing with time," Harvard University astronomer Avi Loeb said in a March 2014 Space.com article. "So, if you wait long enough, eventually, a distant galaxy will reach the speed of light. What that means is that even light won't be able to bridge the gap that's being opened between that galaxy and us. There's no way for extraterrestrials on that galaxy to communicate with us, to send any signals that will reach us, once their galaxy is moving faster than light relative to us." Some physicists also suggest that the universe we experience is just one of many. In the "multiverse" model, different universes would coexist with each other like bubbles lying side by side. The theory suggests that in that first big push of inflation, different parts of space-time grew at different rates. This could have carved off different sections — different universes — with potentially different laws of physics. "It's not impossible, so I think there's still certainly research that needs to be done. But most models of inflation do lead to a multiverse, and evidence for inflation will be pushing us in the direction of taking [the idea of a] multiverse seriously." While we can understand how the universe we see came to be, it's possible that the Big Bang was not the first inflationary period the universe experienced. Some scientists believe we live in a cosmos that goes through regular cycles of inflation and deflation, and that we just happen to be living in one of these phases.